* ‘Dabiq’ is the Islamic State’s non Arabic periodical online Magazine, named after a key site in Muslim apocalyptic mythology. Dabiq is a place in Northern Syria near Aleppo The town is the site of the decisive battle of Marj Dabiq between the Ottoman Empire and the Mamluk Sultanate in 1516. In Islamic eschatology, it is believed that Dabiq is one of two possible locations for an epic battle between invading Christians and the defending Muslims which will result in a Muslim victory and mark the beginning of the end of the world (similar to Armageddon in Christian theology). Choosing such a name for the magazine highlights the Caliphate’s goals. Dabiq was first published in 07/2014 in a number of different languages including English. Issue number 1 carried the date “Ramadan 1435” in Islamic Hijri calendar. While al-Qaeda in the Arabian Peninsula’s INSPIRE MAGAZINE focuses on encouraging its readers to carry out lone-wolf attacks on the West, Dabiq is more concerned with establishing the religious legitimacy of the Islamic State and its self-proclaimed Caliphate, and encouraging Muslims to emigrate there. 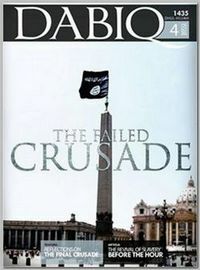 On its10/2014 issue, a photoshopped picture on the front story cover titled “The Failed Crusade”, depicted ISIS’s jihadi black flag raised atop the Egyptian obelisk at the center of St. Peter’s Square in the Vatican. An article outlined religious justifications for slavery, especially women slavery, and praised its revival. In 02/2015 Dabiq listed Christians as the Islam main enemy. I,S,I,S regularly puts out a glossy propaganda magazine aimed at recruiting jihadists from the Western Democracies. It is sophisticated, slick, beautifully produced and printed in several languages including English. It portrays the Islamic State as they see themselves: boasting of their victories and painting a romantic image of the restoration of an Islamic golden age and the heralding of a “glorious” new Caliphate based on holy war.